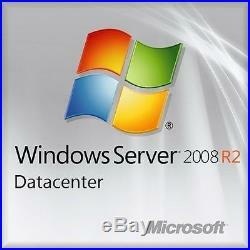 GENUINE WINDOW SERVER 2008 R2 DATACENTER 25 CAL EDITION 64-BIT x64. Both PHYSICAL ACTIVATION LICENSE and VIRTUAL ACTIVATION LICENSE FOR UNLIMITED VIRTUAL INSTANCES INCLUDED. 64bit, supports all languages, and online updates. Server 2008 R2 Datacenter Edition MLK kit with activation license. Is to install Server 2008 R2 Datacenter 25 CAL Edition activation licenses set for Clean/Fresh installation, it cannot be used as a upgrade, there's is no upgrade in server family and it cannot be used as upgrade; upgrade was never released. This is FULL PRODUCTION LICENSE SET with PHYSICAL LICENSE and UNLIMITED ADDITIONAL VIRTUAL LICENSE. These are full production licenses and will work with 2008 R2 Datacenter Server Edition ONLY. 64bit, supports all languages, and online updates, Please have the date and time set correctly before activation. Windows Server 2008 R2 Datacenter is an advanced server platform that provides more cost-effective and reliable support for mission-critical workloads. It offers innovative features for virtualization, power savings, and manageability and helps make it easier for mobile workers to access company resources. Description : Windows Server 2008 R2 builds on the award-winning foundation of Windows Server 2008, expanding existing technology and adding new features to enable IT professionals to increase the reliability and flexibility of their server infrastructures. New virtualization tools, Web resources, management enhancements, and exciting Windows 7 integration help save time, reduce costs, and provide a platform for a dynamic and efficiently managed data center. Powerful tools such as Internet Information Services (IIS) version 7.5, updated Server Manager and Hyper-V platforms and Windows PowerShell version 2.0 combine to give customers greater control, increased efficiency and the ability to react to front-line business needs faster than ever before. Windows Server 2008 R2 is the most advanced Windows Server operating system yet, designed to power the next-generation of networks, applications, and Web services. With Windows Server 2008 R2 you can develop, deliver, and manage rich user experiences and applications, provide a highly secure network infrastructure, and increase technological efficiency and value within your organization. Please note that the new R2 version does not support 32-bit (x86) processors. IA64 or x64 architecture is required. Windows Server 2008 R2 builds on the success and strengths of its Windows Server predecessors while delivering valuable new functionality and powerful improvements to the base operating system. New Web tools, virtualization technologies, security enhancements, and management utilities help save time, reduce costs, and provide a solid foundation for your information technology (IT) infrastructure. Minimum: 1.4 GHz (x64 processor). Minimum: 32 GB or greater. Note: Computers with more than 16 GB of RAM will require more disk space for paging, hibernation, and dump files. Super VGA (800 × 600) or higher resolution monitor. DVD Drive, Keyboard and Microsoft Mouse, Internet access. EDITION COMPARISON BY TECHNICAL SPECIFICATION. Up to 4 Virtual M. 0 feedback, up to 30 days new users, non-us users. If there is any issue to resolve you acknowledge NOT to open a case or post feedback before resolving any issue. Once again thank you for understanding. Because of the fact there is no way of finding out if the serial number was used or not and once exposed it cannot be resold. Item will be packed well. The item "MSFT Server Window 2008 R2 Datacenter Edition 64 bit x64 and 25 CAL USERS" is in sale since Tuesday, January 1, 2019. This item is in the category "Computers/Tablets & Networking\Software\Operating Systems".